We are here with Jaleel White, who is best known for his role as nerdy Steve Urkel in the sitcom Family Matters. Jaleel has really grown up and is beyond his Urkel days, but at times it seems fans still confuse him with the character that he played. So today I wanted to get his impressions of Germany Chancellor Angela Merkel. So, Jaleel, I was strangely excited to meet you in person. Well, I was a huge fan of the show. You played this iconic character. And then you grew up and seemed to be one of the few to break free. Wow, I really appreciate your saying that, sometimes it is tough. People are always coming up to me and asking me to act like Urkel. It really grates on me. 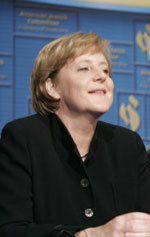 To demonstrate your intellectual chops, I wanted to get your impressions of Angela Merkel. Well, Chancellor Merkel showed great leadership qualities with the Syrian refugee crisis and now, dealing with the fallout of Brexit. . .
Oh, I am sorry, I was expecting you to respond in your Urkel voice. My Urkel voice? I am a businessman now. I sell real estate. I may become a politician. I follow world events. But what would Steve Urkel say? My readers want to know. C'mom man, I am beyond that. I was on friggin' Dancing With the Stars. I even beat up my girlfriend to help shake that image. Just go with it for a minute at least. Let's set the scene. You have a romantic crush on Chancellor Merkel, do you not? And you caused her to have all those problems with the EU, and Syrian refugees, and Brexit, right? Oh, screw it. Ok, here it goes. "Did I do that?" Friggin' happy now? Thank you Steve, for coming back and lending your special voice for my interview. I really hate you, you know.